After launching the new members of the Galaxy M family , Samsung is now preparing to launch the remaining Galaxy A handsets pretty soon . That’s why the number of rumors about the devices has skyrocketed in recent weeks. We already had details and leaks on the Galaxy A10 , A20 , A30 and A50 which have now been officially launched by the Korean manufacturer . 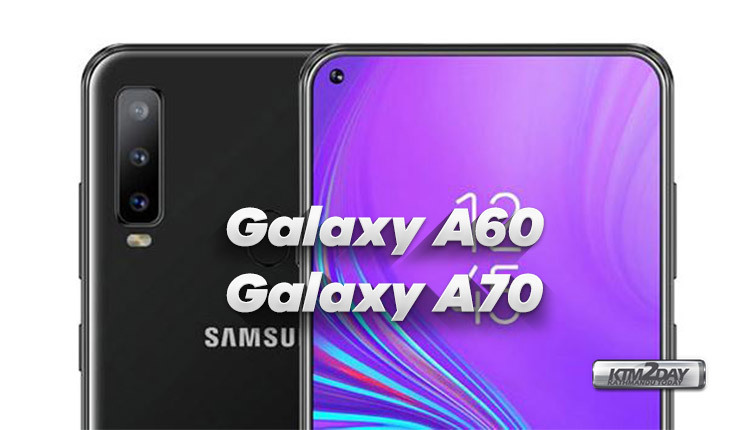 Now, the site MySmartPrice has obtained new information that points to the launch of two more devices : Galaxy A60 and A70 . According to related sources, these two models will be made official in Indian market very soon. In addition, Samsung also plans to bring at least one device with Android Go . With this way, the company hopes to complete its portfolio of smartphones for every price segment, notably from the A-Series . Now, speaking a little more about the Galaxy A60 and A70, rumors point out that both the phones will come with triple rear cameras, which doesn’t come as a surprise. Next, the Galaxy A60 will come with a rear-mounted fingerprint sensor, while the Galaxy A70 will likely get an in-display fingerprint sensor. As for the display, it seems the Galaxy A60 will come with an Infinity-O punch-hole screen like the Galaxy S10. The TENAA listing mentions a 6.3-inch display and a battery capacity of 3,410mAh. The Galaxy A60 is said to measure 155.2 x 73.39 x 7.9mm. Meanwhile, the Galaxy A70 will stick with an Infinity-U waterdrop display and the screen size will be noticeably big at 6.7 inches. Both the displays are likely going to come with FHD+ resolutions. The Galaxy A70 will also come with a 4,400mAh battery, which is in line with past rumours. The listing doesn’t offer specific details on the triple camera setups on the Galaxy A60 and Galaxy A70 phones. We also have no information at this time about the processors powering the two devices, but we expect TENAA to update the listings over the next few days. Samsung will be holding “A Galaxy Event” on April 10 where the company will announce a few new Galaxy A devices. The highlight of the show is expected to be the Galaxy A90, which is rumoured to come with a pop-up selfie camera and a Notchless Infinity screen, among other things.